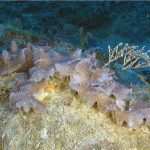 In 1986, a mysterious single-celled creature named Gemmocystis cylindrus was discovered living within the tissue of several different Caribbean stony corals. 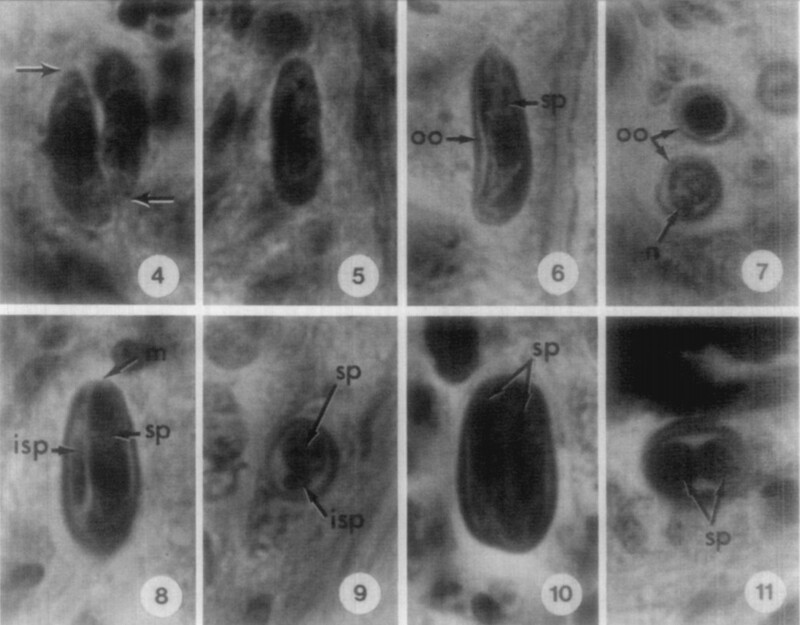 Nothing like it had ever been seen before in a coral, and, unlike the zooxanthellae that fuel a coral’s metabolism, this enigmatic protist had no chloroplasts. Whether it was friend or foe—symbiont or parasite—was quite unclear at the time. More than three decades later, we still know relatively little about Gemmocystis. The initial description identified it as an apicomplexan—a phylum that’s home to the causative agents of malaria (Plasmodium) and toxoplasmosis (Toxoplasma). This latter parasite is what’s known as a coccidian—this is one of the subgroups of the phylum—and it makes its living within our intestinal cells, growing, dividing, and shedding off spores that will eventually infect its true host, cats. Gemmocystis appears to lead a similar life, and recent molecular study places it among these parasites. You’ll find Gemmocystis isolated to the “cnidoglandular cap” of the coral’s mesenterial filaments. These filaments are normally concealed within the body cavity of corals (though they can be extended defensively by some species) and function in a manner analogous to our digestive system. What it does here is hard to say. Perfectly healthy colonies have been found to harbor it, as have diseased corals. 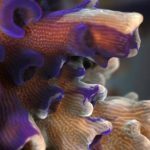 Considering that the Coccidia are otherwise all parasitic and associated with digestive organs, it stands to reason that Gemmocystis is also an unwanted part of the coral holobiont. Now, to clarify an earlier point, we don’t specifically have any genetic data for Gemmocystis. What we have instead are environmental samples—water, sand, coral mucus—which have been sequenced. The random bits of DNA produced using this method can be compared, and it then becomes possible to recognize all the microorganisms that would otherwise escape our notice. Since there’s no physical specimen to examine, the resulting DNA signatures can only be tentatively identified. Instead of calling these “species”, microbiologists use the term “Operational Taxonomic Units” to signify their distinctiveness from one another. For the lineage of coral-associated coccideans, more than 3,800 OTUs are known, from at least 8 major clades. That is an immense amount of hidden biodiversity, which, to put it into perspective, is more than the total number of zooxanthellate stony corals (estimated at somewhere around 2,400). While Gemmocystis might be a stony coral specialist, the group to which it belongs has diverse talents. These protists, recently given the informal name corillicola, meaning “coral-dweller”, have been sampled in association with nearly every major group of anthozoan, including the soft corals, zoas, anemones, and black corals. The only one missing here is the ceriantharian tube anemones, which may just stem from a lack of sampling. These corillicolans abound in shallow tropical reefs, with more than 80% of the samples examined in Kwong et al. 2018 testing positive, but you can also find them in non-photosynthetic corals like Tubastraea and as deep as 500 meters. The true range of their hosts and habitats can only be guessed at. 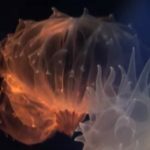 It’s probable, and perhaps likely, that every coral on the planet has one or more of these species dwelling within their mesenterial tissues, even those in the deepest of abyssal trenches. The group also offers some intriguing evolutionary insights into the shift that occurred among the ancestral apicomplexans on their way towards a parasitic way of life. 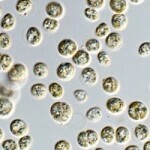 The phylum is part of a larger lineage that includes the dinoflagellates—home to the photosynthetic zooxanthellae—as well as the obscure and only recently discovered Chromerida. This latter group is the closest known relative of the apicomplexans and is noteworthy for having retained its chloroplasts. 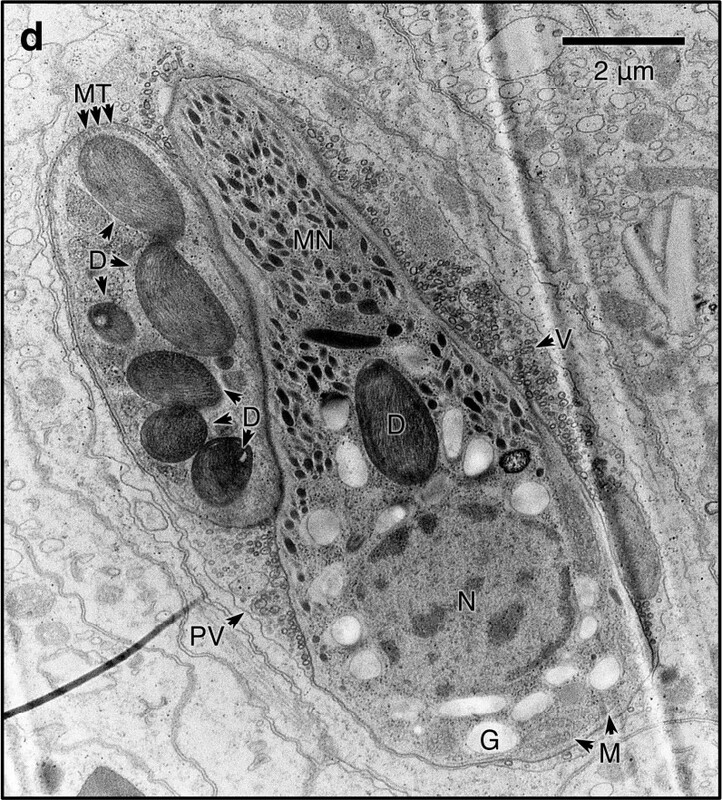 In the apicomplexans, the chloroplast underwent a reduction in its genome, losing the ability to photosynthesize, and became radically altered to aid the parasite in entering its host’s cells—this modified plastid is called the apicoplast. Uploaded by Jitka Kručinská on 2015-06-01. The size and complexity of the plastid genome among the corillicola falls somewhere between these two, befitting its intermediate placement in this evolutionary history. Like other apicomplexans, it has lost the genes responsible for transcribing the protein complexes used in photosynthesis—called photosystems—but, strangely, it has retained the genes necessary for producing chlorophyll, the pigment that initiates photosynthesis. Whether they use these genes to actually produce chlorophyll is of course unknown, and it may be that these are simply an evolutionary vestige—the corallicolan equivalent of an appendix—still in the process of being lost from their genome. Or perhaps these pigments really are still present and serve some other function that we can’t even guess at yet. We clearly have a lot left to learn about these elusive coral-loving protists. The very basics of their biology and ecology and biodiversity are probably still decades away from being well-understood. The corallicola and the Chromerida stand as two of the most remarkable discoveries in modern microbiology, and they may someday help us to cure some of our most troublesome parasites, so expect to hear much more about them in the years to come. 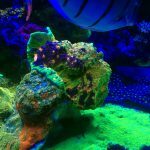 Unlike most obscure reef creatures, these should attract considerable interest from researchers. Kwong, W.K., del Campo, J., Mathur, V., Vermeij, M.J. and Keeling, P.J., 2018. A widespread coral-infecting apicomplexan contains a plastid encoding chlorophyll biosynthesis. bioRxiv, p.391565. Upton, S.J. and Peters, E.C., 1986. A new and unusual species of coccidium (Apicomplexa: Agamococcidiorida) from Caribbean scleractinian corals. Journal of Invertebrate Pathology, 47(2), pp.184-193.